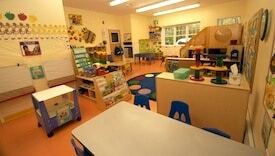 There are dozens of great preschools in and around Stamford. What sets Art, Nature & Me apart is that we are a field trip! Art, Nature & Me is nestled in the northeast corner of the Stamford Museum & Nature Center, a beautiful 118-acre site that boasts, among other things, a working educational farm, an art gallery, 80 miles of hiking trails, an observatory and planetarium. Each year, hundreds of area schools pay to send their students to SM&NC on field trips to take advantage of its wonderful facilities and educational resources. 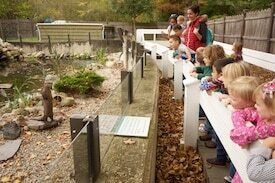 At Art, Nature & Me, our kids get to do all this and more-every day! From participation in all the seasonal activities at SM&NC (such as helping add apples to the press during cider-making season, plus counting sap buckets and checking sap levels during maple-sugaring season) to almost-daily farm visits and nature walks, these "field trips"-and then some-form part of our core curriculum. 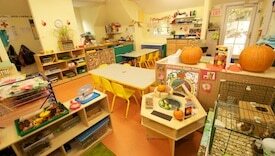 Hand in hand with this impressive array of outdoor learning environments, Art, Nature & Me boasts four bright and welcoming classrooms. 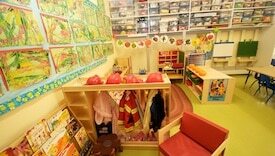 Each room is equipped with interest areas (a reading area, a math and science table, a sensory table, an art table, a block area, etc.) that complement and reinforce the work done in our "outdoor classroom." Thanks to our team of dedicated, dynamic teachers, these stations are constantly altered and updated to keep our preschoolers' interest. 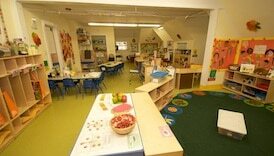 The downstairs level of the preschool building is geared to the 3s' programs; the upstairs is devoted to the 4s. "Thank you so much for the tour of your school today. I am so excited to have found your program! I love that the focus is on art, nature and fun. I liked your themes and how you carry them through to all activities. I found the teachers to be nurturing as I watched them interact with their children. I also felt so comfortable with you as a director, which is really important when you are leaving your three year old child for the first time." List of interest for the 2019/20 school year starts September 1, 2018. 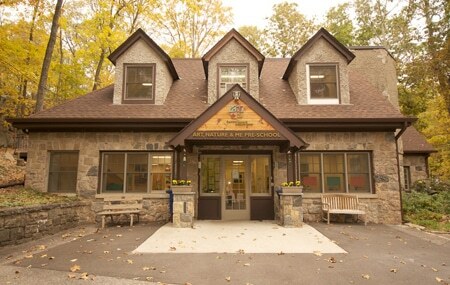 Enrollment is conditional on the student's family having a family membership to the Stamford Museum & Nature Center. 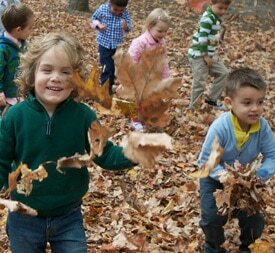 Framed by a beautiful forest backdrop, Art, Nature & Me boasts its own natural playground, which is solely for use by our preschoolers. 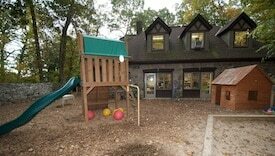 There's something for every child in this carefully thought-out play area that sports a variety of outdoor play stations (a sandbox, a climbing structure, a water table, a playhouse, an outdoor easel, etc.) as well as some specially commissioned fun new additions: a natural wooden hut, a hollow wooden log and a fenced-off (real!) chicken coop that is home to our very own chickens. With more than 80 acres of nature trails to choose from, there's no time for such a thing as bad weather at Art, Nature & Me-just bad clothes! We truly embrace the great outdoors by dressing for the elements and hitting the trails no matter the weather. From the first snowflake of the season to the soft chirping of a newly hatched bird, it's out on the trails (and with the help of our knowledgeable teachers) that the kids really get to experience firsthand the beauty and wonder of nature and witness the changing seasons. One of the preschoolers' favorite hikes is to the vernal ponds, where they love to listen for frogs and scoop up salamander eggs and pond insects. Chippy's Trail, enjoyed for the soothing gurgle of the nearby brook and its excellent potential for sighting "Chippy" (i.e. any chipmunk! ), is another popular route. SM&NC's living, working Heckscher Farm, with its large family of farmyard animals, is just a five-minute walk from the classroom. Here, from helping brush the goats to feeding the chickens, the kids literally get to roll up their sleeves and learn firsthand what farm life is all about. Other highlights of farm visits include meeting the new lambs, kids, ducklings and chicks in spring; chatting to the farmers as they go about their daily chores; and participating in apple cidering and maple sugaring during those respective seasons. Last but not least, the otter pond (home to famed river otters Sadie and Bert) are other popular stops while at the farm. For more information or to place your child on the List of Interest please contact Ellen Reardon or Lisa Combs, Co-Directors of Art, Nature & Me Preschool at 203.977.6528 or email preschool@stamfordmuseum.org.